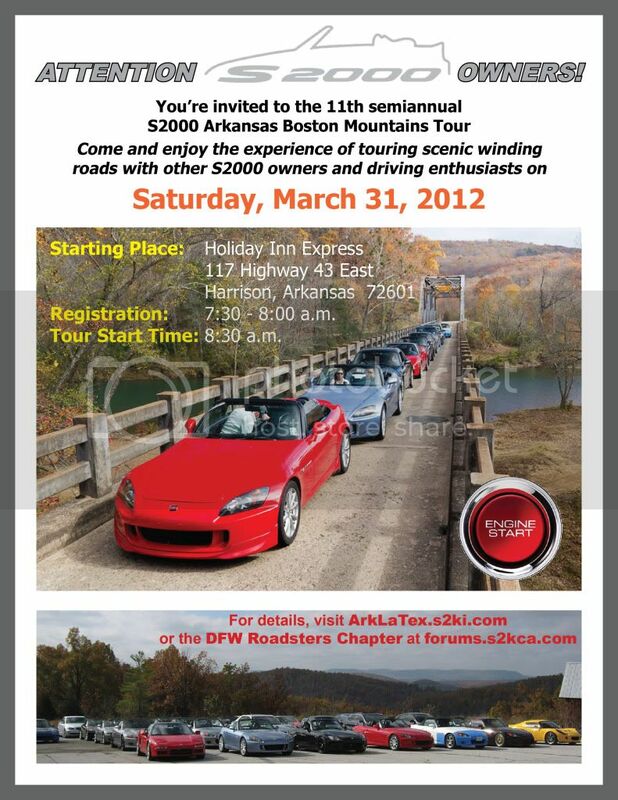 Dear Friends, you are invited to attend the 11th Semi-annual S2000 Arkansas Boston Mountains Spring Tour 2012. The Spring 2012 Tour will cover some of the best winding and scenic roads that the Arkansas Boston Mountains range has to offer. Those that have attended in the past can tell you how much fun this event is. We have a block of 10 rooms set aside, and have a group rate of $85.99 + tax / Night for a 2 Queen Bed Room or $110.99 + tax for a suite. They will have a lunch buffet and salad bar set up for us as well as ordering off of the normal menu. Menu orders are what you will see on the menu. We ate there on the pre-drive and the food was very good! They also have a large parking lot to accommodate us. MAKE SURE TO BRING SOME CASH THEY DO NOT TAKE CREDIT CARDS!! You can sign Mpetus up as a Tour Guide! Also, your clipboard is available if you need anything!! i was peeing in the ditch when that bridge picture was taken. hahaha. maybe my buddy lindsey also. i'll let you know for sure though. Becky, thanks!! I will be sending out emails and text messages to you guys. I'm in. I can be a sweeper again if need be. My usual policies. Awesome!!! We'll be there for the predrive as well! A buddy of mine with a WRX STi may attend as well, will let you know.